This topic contains 3 replies, has 2 voices, and was last updated by Devils Tower 8 months ago. 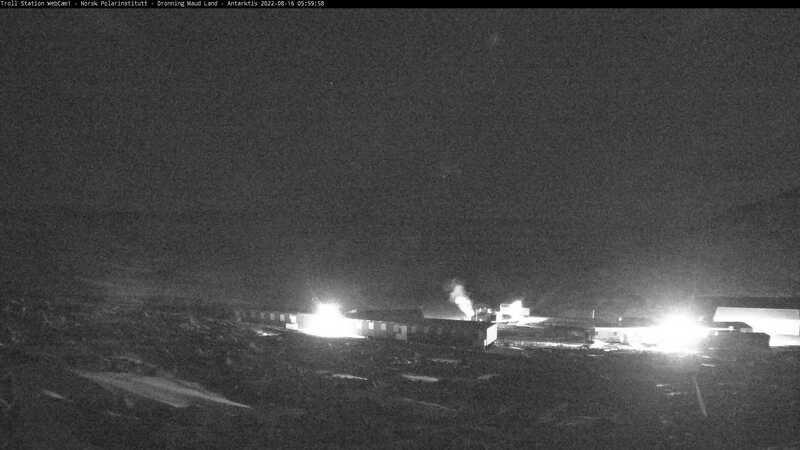 I captured what I believe to be part of the Wormwood /// Planet X /// Nemesis system above Troll Station, Antarctica on August 15th and again on the 16th….You can see these images at my minds page, cause I cannot load them here….PLEASE go take a look at them….Totally free site, and free too look at them…Pass the info along….I also included the moon phase of the day, so you can clearly see this is not the sun nor the moon here…..
You can also go and check the page out yourself too see if it re-appears…. This topic was modified 8 months, 1 week ago by Devils Tower. Thanks for this post. This is really weird indeed. I was in Antarctica in several reaserch stations and I’ve nerver seen that before. Troll is 235 kilometers (146 mi) from the coast, so the reflection is on the snow. Now we are in winter at the north pole, so the moon is up all day and the sun is down all day. One of those dots is thus clearly the moon (I would bet on the brightest object. The weird shape is probably due to a lense deformation. The other one is its reflection probably. Holy COWS….I am so freaking envious too no end is what I think eh…I wish I could go back in time before I became disabled and take all my networking experience and IT experience and MOVE too Antarctica sir….Serious…I am an extreme introvert…I have left my house in the Black Hills (extreme rural) like all of twice in two years, and then just too go to the store for groceries…I have LITTLE TO NO need for the world at large or thus, the people in it…I would THRIVE in such an extreme environment…I was also born in Anchorage, Ak, and am part Athabaskan Indian, so this is MY KIND OF PLACE EH..!!! Super serious…Oh how I would do it all different if I could only go back…But I digress…. As for your thoughts…I have not the FAINTEST idea….This is EXACTLY why I float these by superior people like yourself…I am no camera man…Not much of a social media guy either, but since being born again in early 2017, and seeing all these changes matching with Biblical scripture matching 100% to end times described in said Bible, have made all the effort I can too change my introverted, inept, social media retardation into at least a beginners conceptual grasp, and made as much effort as I can too reach out and share the Bible with others as I can….NONE THE LESS…You sound as though you would be FAR more versed in understanding of these images than myself eh…So I am going to have too defer to your explanation here…. Thanks for getting back too me eh, God Bless you for all your AWESOME work…. This reply was modified 8 months ago by Devils Tower. I am not trying to be in any way shape or form argumentative…. Whatever I caught here on the 16th, there is no way it is the moon…. Look at the date /// time stamps…. At least that is my totally unprofessional /// novice opinion….